I asked a good friend of mine what he was doing for his wife for Mother's Day - and he said - it's all based on what she wants to do for her mom, isn't it? And yep. This is my 4th Mother's Day as a mom, but it's always been about my Mom first. And, Aaron let's us do our thing, so it's a day WITH my mom, which is wonderful in itself. Three years ago he had the great idea of getting us tickets to the Red Sox (my mom is a HUGE fan) and it's now a tradition. We always have a wonderful time. 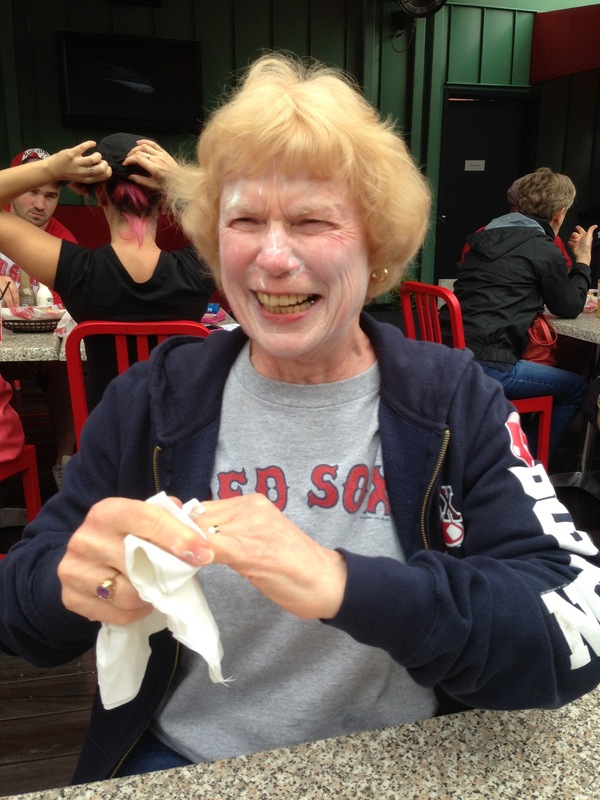 Mom is awful about putting on sunscreen. So I was nagging at her to put some on - and she made a big deal and was joking around, and probably tried to put a full handful on her face. We were laughing so hard we were crying! At the end of the game they annouced that all Mother's could come and run the bases with their child after ﻿the game. Mom looks at me and says - let's go! We waited through the final two innings and were basically first in line. It was awesome. All the women running around those bases had such a HUGE smile on their faces (including us!). It was a great day. I got home just in time to read a couple stories and tuck the kids in. I feel very blessed to have such a great relationship with my mother and know Cam and Maggie do too. Sounds like a fun day! Happy belated Mother's Day to you! That looks great! I think the running the bases part was my favorite!